An 18-year-old student, Ebenezer Israel Inya have accused the Police Officers working at the Kpirikpiri Police Station Abakaliki, Ebonyi State capital of beating his father, Israel Inya Aluu to death right inside the Police station, The Nation reports. The incident happened on Wednesday this week after the father, Ebenezer and some of his friends were arrested inside the compound of the Assemblies of God Church which is near their house. Ebenezer, who lives in 4 Nri street, and his friends were playing football on the Street road when the ball flew into the compound of the Assemblies of God Church which is located on No 2 Nri street. The Church officials then allegedly got a female police officer, who is also a member of the church, to arrest the boys and the father for disturbing Church activities by playing football around the premises. 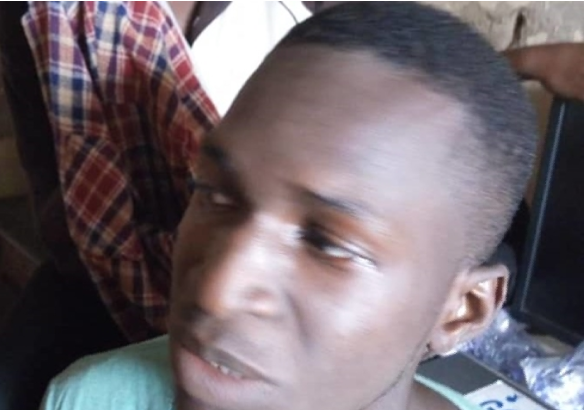 Narrating what happened to The Nation, Ebenezer a 200 level student of Criminolog, said they had earlier quarreled with the gate man of the Church who seized their football when it fell into the Church premises and later were attacked by some members of the Church. “The pastor’s daughter came in and asked us what was happening and we told her that our ball entered into their premesis and that she should help us to get it back”. “She told us to go let her talk to the man so that he can release the ball and then she will call us later to collect the ball. After sometimes, we returned to the church and met the gateman to release the ball to us and he started exchanging words with us. “The senior pastor then came out and started insulting us, I exchanged words with him. The pastor’s children and some church members there started attacking us. They later asked us to go to our house so that the crisis will be resolved, we went back to our house”. He said some members of a para- Millitary outfit of the Church later lured him into the church premises where a female police officer of the command who was on maternity leave arrested them. “I was about taking my bath to come to our shop at Police Officers Wibee Association (POWA) at the police headquarters when two security officials from Royal Ranger security firm came to me and said I should follow them to go and apologize to the pastor so that peace will reign. I insisted that I will not go anywhere, they threatened to call the military if I don’t resolve it this way”. “I followed them to the church. A member of the church who is a policewoman and who is on maternity leave and was wearing mufti came with a handcuff to handcuff us and we asked the offence we committed and insisted she must tell us our offence. “She refused to give us the reasons and locked the gate. They started beating us inside the church. My dad who was in our house heard it and came to the church. He said they should stop beating us again and that we should all go to the police to iron things out”. “They insisted that they were not going to the police but must do everything inside the church. When they saw that the pressure was high, the policewoman took us out of the gate and started beating us. “We got to the station with my dad and they locked us(I and my brother) in the counter and started beating me. Then they told my dad to follow them to a room, my dad follow them together with the Assemblies of God people. “The next thing I saw was when they came and released us and asked us to come and carry our father’s body”. When contacted, Police spokesman in the state, ASP Loveth Odah confirmed the incident. Odah said; “On 29th of August 2018, the DPO of Kpirikpiri division, said that there was a call from the Assemblies of God Church at Nri Street, Kpirikpiri that children were playing football and they played into the church premises. “So the security officer whose name I do not know seized the ball because he said that it was a regular thing which he said disturbed the occupants during the church hour. “So, on Friday unfortunately the ball entered there and the security officers seized it. According to them, children started throwing stones on top of the zinc of the church. Along the line, the security officer decided to open the door to see who was doing it. “He saw the two children who were doing it. He accosted them into the premises and now called the policewoman who have handled their matter before. “The policewoman was actually on maternity leave. She was passing through the church to go and fill her gas cylinder, according to her; she parked her bike and entered inside to see what was happening. “The security man opened the door for her and the access paved a way for their father to enter with her into the church premises. They were all judging the as children’s play; ‘let allow it to go like that.’ That’s according to the policewoman. “But the father to the children insisted that since he has accosted the children inside, by so doing, illegally detaining them, so police must be aware of it. The policewoman assisted them to the police station and went her own way because she was not on official duty”. When contacted, Pastor in charge of the church, Rev Joseph Nwakpakpa refused to comment to our reporter. He rather asked the reporter to stop disturbing him.